Inside Llewyn Davis: The Coen Brothers have made the best ever movie about the folk revival. The Coen Brothers’ Inside Llewyn Davis is the best film ever made about the folk revival—and one of the best ever made about music, period. 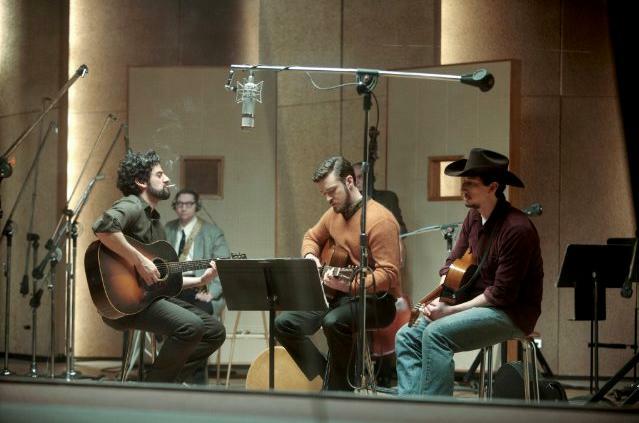 Oscar Isaac, Justin Timberlake and Adam Driver in Inside Llewyn Davis. In September of 1961 the New York Times’ folk music critic Robert Shelton saw an unknown 20-year-old perform at a club in Greenwich Village. The singer, wrote Shelton, “is vague about his antecedents and birthplace, but it matters less where he has been than where he is going, and that would seem to be straight up.” Six months later Shelton’s mystery man released his self-titled debut on Columbia Records, Bob Dylan, a collection of mostly covers that sold poorly. In spring of 1963 he returned with The Freewheelin’ Bob Dylan, a 13-track LP that opened with an original composition called “Blowin’ In the Wind.” Two years and a few other decent songs later, he scandalously plugged in an electric guitar at the Newport Folk Festival, ending his relationship with the community that had birthed him. Just last week that guitar sold at auction for nearly $1 million. It’s safe to say Bob Dylan won the divorce. The Coen Brothers’ wonderful new film Inside Llewyn Davis takes place (very) shortly before Shelton penned his famous review, and while Dylan’s impending arrival looms over the world of the movie, it’s not about him. Instead, it’s about everyone who wasn’t him, and, as such, Inside Llewyn Davis breathes renewed and important life into the early 1960s folk revival, one of the most misunderstood, frequently derided, and hugely significant post-war cultural movements. Aside from producing arguably the most influential American songwriter and most influential Canadian songwriter of the past 50 years—by 1962 a young Joni Mitchell was cutting her chattering teeth in folk clubs in Saskatoon—the folk revival was a formative influence on artists ranging from Nina Simone to Stevie Wonder to Robert Plant to Janis Joplin. Yet in the years since Dylan went electric it’s become fashionable to caricature folkies as luddites dirtying themselves in the dustbin of history, besweatered schoolmarms yelling “Judas” at our most cherished rock star. Folkies get skewered in comedies like A Mighty Wind, treated with aloof disdain in period dramas like Mad Men, made into straw figures of lefty naïveté in reactionary fables like Forrest Gump. This is a shame, and more than a little unfair. As a phenomenon both quintessentially of its time and doggedly seeking to flee it, the folk revival has aged about as poorly as things can age (though not as poorly as Forrest Gump). But it was also one of the great romances of the 20th century, a messily admirable mix of music and politics that believed in itself with a fierceness that few things have since. Its bedrock text was Harry Smith’s Anthology of American Folk Music, a six-LP collection released in 1952 that came to captivate a generation disillusioned by the directions their country was heading: Cold War paranoia, the drum-beat of nuclear brinksmanship, the intransigent racial violence of the Jim Crow south. Folk music promised bygone purity to young people understandably wary of modernity, and the performance of folk music became a powerful force of activism itself. Fifty years on, Dylan and Joan Baez performing at the March on Washington remains the most iconic visual memory of the revival. There is something warm and fitting about the Coens, film’s greatest bards of the star-crossed outsider, finally giving Van Ronk and the folkies their day in the sun. Inside Llewyn Davis both celebrates and sends up the revival’s misbegotten best intentions in ways that are smart and humane. In one of its finest scenes Llewyn is cajoled into performing the 18th-century British ballad “Fare Thee Well” at an Upper West Side dinner party. It’s a beautiful song (at 300 years old, it better be) that’s soon interrupted by his well-meaning host’s impromptu harmonies. Llewyn flies into a rage, suddenly sensitive to his own exploitation, being made to sing for his supper. “But I thought singing was a joyous expression of the soul!” protests his wounded, would-be duet partner. He’s right, but Llewyn is crushed: Not a lot of money is precisely the point. This, too, was an untenable saw of revival hard-liners—once you achieved popular success, your music became immediately suspect. It was a movement with a romantic view of the people but a deeply suspicious view of said people’s tastes; after all, in 1961 the “folk” were mostly listening to Del Shannon and the Shirelles. One of the cruelest ironies to befall the folkies is that much of their music is now far more forgotten than the commercial pop they were so quick to dismiss as empty and ephemeral. The Coens go a long way toward righting this. Inside Llewyn Davis is easily the best film ever made about the folk revival, and it’s also one of the very best films ever made about music, period. For a movie about authenticity obsessions that recreates its place and period with exacting detail, its soundtrack isn’t much for slavish verisimilitude: Oscar Isaac’s singing voice is far more indebted to Jeff Buckley (still a twinkle in his folksinging father’s eye in 1961) than Van Ronk or even Bob Dylan. These anachronisms strangely work, making the music feel newly vital while honoring the spirit and conviction of the period. And the film’s performance sequences are luxurious and fully real: they’re not cut short by impatient edits, hitched to montages, or bludgeoned into bold-faced Turning Points. One of the reasons it’s so easy to be arch about the folk revival is that its naked, full-throated earnestness can’t help but make us uncomfortable. By forcing us to watch a young man sing a centuries-old song accompanied by nothing but an acoustic guitar for three full minutes, the Coens effectively foreclose our capacity for irony. We can’t laugh at the people in the club, because we’re among them. Even more importantly, the intimacy of these sequences brings us face-to-face with the most fundamental fact of musical performance: It is always, first and foremost, an act of courage. For all their musty romance and authenticity fantasies the folkies had no shortage of courage. They believed in personal reinvention through art, the inherent and salvageable goodness of humanity, and the untapped potential of music as a corrective force in the world. I’m not sure we’ve yet earned the right to make fun of these things. At the close of Inside Llewyn Davis we’re finally allowed to hear two voices from the past, the second of which is Dave Van Ronk’s own from a performance close to his death in 2002. Ragged, knowing, unpretty but beautiful, it pours over the credits and sounds unlike anything else in the film, a perfect and richly deserved tribute. At long last, this giant of American folk music is finally the old, the true, the real.